Research papers point out that the house in The Fall of the House of Usher sets forth an evil force, one that eventually traps the narrator. Edgar Allan Poe is a writer that nearly every American is familiar with, encountering his work as adolescents, and being reminded of it every Halloween. As research papers on The Fall of the House of Usher note, the story is entirely dependent upon the physical structure of the mansion in setting into motion the events of the story. Research papers point out that the house in The Fall of the House of Usher, Poe sets forth an evil force, one that eventually traps the narrator. Only the death of both Ushers (whether as described by the narrator or not) and the self-destruction of the house can rid the world of this evil. Poe may not have been a genius, but his writing survives for its creativity, tapping into many of our collective nightmares. The Fall of the House of Usher is one of his more famous works, and distinguished by several literary devices. Both the point of view of the narrator and the physical setting/atmosphere contribute to the overall effect of the story. The end sequence of The Fall of the House of Usher is, on the surface, simple. Research papers on The Fall of the House of Usher note that she has come to seek vengeance upon her brother. This denouement is precipitated by the narrator, and can possibly be explained in another way. Poe himself provides this realization through his narrator’s observations. “I was forced to fall back upon the unsatisfactory conclusion that…there are combinations of very simple natural objects which have the power of thus affecting us”. The house is described as a crumbling mansion, covered with fungi and sporting a large crack in the foundation. “The crack in the building corresponds to Roderick’s struggle against insanity”. The fissure can also be seen as the split between Roderick and Madeline Usher, twins who are mutually affected by Roderick’s illness. While he suffers from the family disease, it is she who is afflicted by sleepwalking and catatonia. None of this is possible without the decaying condition of the mansion. “The power of the mansion and the tarn to influence the mind of Roderick is, in part, explained by his belief in the sentience of things”. In other words, Roderick’s condition (which thus affects his sister) is dependent upon his believing in the power of the crumbling house. Roderick’s condition is “a constitutional and family evil”. He has sent for the narrator out of an earnest desire to see him and “the solace he expected me to afford him”. It is as though Roderick Usher is aware of the physical effect the ancient family house is having upon him, and hopes that the narrator, as an outside influence and symbol of past happiness, will somehow be able to rearrange the atmosphere of the house, since “Roderick Usher resembles his house”. The end sequence of the story is, on the surface, simple. Roderick announces his sister’s death, her coffin is sealed, and strange noises are heard, which Roderick fears are the screams of his not-dead sister. Suddenly, the ghastly apparition appears, both Ushers fall dead, and the narrator flees. One critic notes that she has come to seek vengeance upon her brother. “She refuses to be swallowed up by the earth alone and demands that her brother share in this last and final transformation”. This denouement is precipitated by the narrator, and can possibly be explained in another way. A great deal of attention is devoted to the screwing down of the coffin lid and the sealing of the door to her tomb. The two men then retreat “into the scarcely less gloomy apartments”. Rather than breaking the atmosphere, Madeline’s death enhances it, so that by this time it must affect the narrator. The narrator becomes caught up in Roderick’s madness because he has become a resident of the house. If the house were physically responsible for Roderick’s illness, then surely such power would be transferred to any inhabitant. Poe’s narrator is caught in the web of the Usher madness, and the narrator even welcomes mad Roderick in place of solitude in this house. “His air appalled me—but any thing was preferable to the solitude which I had so long endured, and I even welcomed his presence as a relief”. The narrator begins to read, and having succumbed to the atmosphere of madness, is transformed into believing the ravings of a lunatic. The final key to Roderick’s madness is the belief that his sister has been buried alive. The ghastly noise from deep inside the catacomb is exactly the echo “of the very cracking and ripping sound” just described in the book he is reading. We are led to believe by the narrator that the figure of Madeline did appear at the door, and both Ushers fall dead while the house collapses. The narrator has been caught in the madness of Roderick Usher, and full well believes the madness, to the point of seeing what Roderick sees. 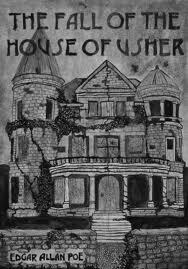 The Fall of the House of Usher is entirely dependent upon the physical structure of the mansion in setting into motion the events of the story. The house sets forth an evil force, one that eventually traps the narrator. Only the death of both Ushers (whether as described by the narrator or not) and the self-destruction of the house can rid the world of this evil. Metaphor - Metaphor research papers analyze how to use metaphors to convey ideas in Literature. Ligeia - Romantic Era and Fall of the House of Usher illustrates how Edgar Allen Poe's novel is symbolic for the fall of the Romantic Era in Literature. Barbauld's Poem The Rights of Woman - Romantic Era and Fall of the House of Usher illustrates how Edgar Allen Poe's novel is symbolic for the fall of the Romantic Era in Literature. Leopold von Sacher-Masoch - Leopold von Sacher-Masoch research papers on the man that had the term masochism named after him for his short stories exhibiting his sexual fantasies and fetishes. Endymion - Literature research papers on Endymion illustrate that Keats was one of the greatest of Romantic Poets. Gothic Literature - Gothic Literature research papers examine the genre that generally contains some element of horror or the supernatural. Ethan Frome - A research paper on Ethan Frome presents the opportunity to look at literature from the view of the early 20th Century Victorian Era Romantics. Victorian Literature - Victorian Literature research papers discuss the literature created during the 19th Century Victorian Era. Romanticism - Emotional expression was at the heart of authentic experience during the Romantic era. William Wordsworth - William Wordsworth Research Paper looks at two of this poets works and also focuses on the emphasis of romanticism. The Cask of Amontillado - The Cask of Amontillado research papers analyze Edgar Allen Poe's short story about revenge. The Narrative of Arthur Gordon Pym by Edgar Allen Poe - Edgar Allan Poe's The Narrative of Arthur Gordon Pym appears on the surface to be the retelling of one man's adventure at sea. The Pit and the Pendulum by Edgar Allen Poe - Research papers on The Pit and the Pendulum point out Edgar Allan Poe immediately grabs the reader's attention by announcing that he is sentenced to death. The Tell-Tale Heart - Research papers on The Tell-Tale Heart focus on the sanity of the narrator. The Black Cat - The Black Cat research papers discuss a short story by Edgar Allen Poe, and examines the Antisocial Personality Disorder of the narrator. Death in Literature - Death in Literature essays discuss the common theme of death in different works of literature. Paper Masters writes custom research papers on and point out that the house in The Fall of the House of Usher sets forth an evil force, one that eventually traps the narrator.